The performance world has long known the advantages stainless steel brake lines give to brake systems. Even new rubber brake lines can? ?t match stainless steel for brake performance. Rubber expands under pressure. The older the lines, the more they expand. The hotter the brakes and brake fluid get, the more the rubber line expands. All this expansion adds up to decreased brake power at times when you need it the most. Through a special arrangement with Paragon Performance Randakk's Cycle Shakk is now the exclusive source for these superior brake and clutch line kits. All hose sets are made in the USA by Paragon. Our Stainless Steel Lines have a Teflon core, for a smooth linear brake ??feel?. The next layer is Kevlar reinforced braiding, to resist expansion and add flexible durability. Wrap these two inner layers in a braided stainless steel casing covered with a polyethylene coating and you have a DOT approved brake line capable of handling 4000 psi of pressure. Each hose is pressure-tested at 3,000 psi during the quality assurance process. There is no substitute for braking skill in reducing braking distances. Stainless steel lines improve brake performance potential, but that potential can only be realized via the inputs of a skilled rider! If you are not familiar with brake maintenance functions and service techniques, have a professional mechanic do this installation! You can? ?t afford the consequences of improper brake work. Once your new stainless steel lines are installed, take some practice time to acclimate yourself to the feel and performance of your new brakes. All prices above include Priority Mail Shipping for US customers. 1. All front brake set top hoses (to master cylinder) are correctly sized to the original OEM handlebar setup. The top hose may be somewhat longer than expected to accommodate all market/variants for a given part number. Routing the hose with appropriate curvature will accommodate the extra length. 2. Our brake hose sets are not suitable if you have taller than normal aftermarket handlebars, "bar-risers," "bar-backs" or the like. 3. Be aware that if your top hose is incorrectly routed (many are) that may make our top hose seem too short. You may have to move the hose into a different orientation with respect to the top bridge and headlight bracket if that is the case. 4. 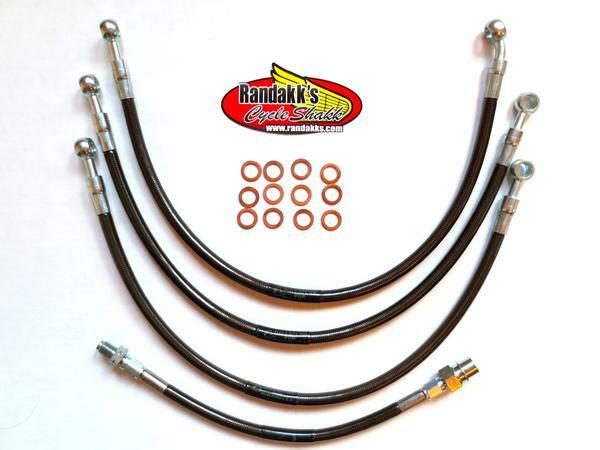 All 4 and 3 Line Brake Hose Kits include the rear hose. 5. All stainless steel hoses have a durable protective covering. 6. New crush washers are included with each set. 7. The clutch hose listed above supports all GL1200 and GL1500 models. It extends all the way from the clutch master cylinder to the clutch slave cylinder. It eliminates the hard "pipe" section found on some models since those were prone to corrosion problems. The GL1500 clutch line does not follow the exact routing of the OEM line. 1 line from second master cylinder pipe to rear caliper. See: Special Honda GL1500 Stainless Steel Brake Hose Installation Instructions. 9. Brake hoses are sold in complete sets only. We do not offer individual hoses or custom lengths. 10. Brake hose sets are designed to support the OEM linked brake setup were so-equippped (1983 and later models). If your linked brakes have been "de-linked," these brake line sets will not fit. 11. The hardware package sent with all brake line sets includes banjo washers and a "clip" used on the rear hose on some models. Discard the clip if not needed for your application. 12. Left/right and up/down orientations of all hoses must be carefully maintained to match the stock configuration. 13. It is a best practice to install hose connections to the calipers with the wheels slightly (and safely!) elevated off the floor. This ensures that adequate "slack" is maintained in all hoses that must accommodate suspension movement. 14. Brake Bleeding Tips applicable to all models .